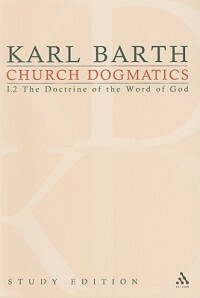 A background project I’m chipping away at during 2011 is volume 1 of Karl Barth’s Church Dogmatics. For Christmas I got the 2010 paperback study edition, which is definitely worth getting over the first edition for the translation of all the Greek and Latin quotes. The smaller font sections, where Barth interacts with other theologians, are some of the most interesting parts. Thus far, his favorite sparring partners seem to be Luther, Calvin, and Melanchthon, with Augustine and Aquinas also making regular appearances, Schleiermacher and Tillich as the occasional whipping boys, and occasional references to all kinds of others I’ve never heard of, like Vincent of Lerins (34), or Hermann Cutter (71). Its interesting the way he regularly distinguishes his view as the “evangelical” view between Roman Catholicism and liberal Protestantism (33ff., 58ff.). If I had to articulate as succinctly as I could the main theme that I already see creeping in, I would use these 5 words: theology is not externally verified (hence the title of the work). Two other themes I’m picking up on are (1) faith and obedience are essential for theology, and (2) theology must distinguish between the crater (the reverberation of God’s speech and activity) and the bomb (God’s speech and activity itself). A point that I found particularly interesting was his argument that theological prolegomena cannot be done without reference to the doctrine of the Trinity and Christology (43). There is a short quote from Martin Luther on p. 18 that struck me when I read it and has been turning over and over in my mind ever since. Barth is discussing the need for personal and existential engagement in theology, and he quotes Luther as saying, “not by thinking, but by living and being damned does one become a theologian.” Its a typically “take it with a grain of salt” Lutheran statement, and yet it seems to me to have a certain ring of truth to it. We don’t find God most truly in comfort and thinking, but in a hospital – on a battlefield – at a funeral. If that’s true (and I think it is), its enough to change my whole paradigm. Even if my greatest goal were to become a theologian, a Phd (though of great value) may not be the surest route. How much more if my greatest goal is simply to know and love Jesus Christ! Only on the path of surrender is true knowledge. Excellent words, Gavin. I’m having a similar paradigm shift. Hope all is well in Cali. Thanks, Gav. When reading Barth, it is good also to read Francis Schaeffer’s Escape From Reason, and his The God Who Is There. What Barth meant by theology not verifiable externally can and should be subjected to a critique. Schaeffer did, and compellingly, in my view. Thanks for sharing your thoughts, Dad. Its good to dialogue about these things. I myself have many points where I disagree with and/or don’t understand Barth, but when it comes Schaeffer’s critique, I think we just have a friendly and respectful disagreement. Schaeffer’s portrayal of Barth (as well as Kierkegaard and Aquinas) seems caricatured to me. His cultural interpretations are often very helpful, but during The God Who Is There I struggled to understand how carefully he read many of these thinkers before placing them in his historical categorizations. If I recall, he claimed that Barth was the application of existentialism to theology, had an aberrant doctrine of God, and an irrational view of truth. It would be good to continue to dialogue about this. Even where we might end up seeing things a bit differently, I know I would be enriched by the conversation. I should add that I respect Schaeffer a great deal and find his devotional writings to be very helpful.